Alternanthera is a genus of flowering plants in the amaranth family, Amaranthaceae. It is a widespread genus with most species occurring in the tropical Americas, and others in Asia, Africa, and Australia. Plants of the genus may be known generally as joyweeds, or Joseph's coat. Several species are notorious noxious weeds. These are annual or perennial herbs or subshrubs. While some of the better-known species are aquatic plants, most are terrestrial. They take many forms, from prostrate to erect to floating. The leaves are oppositely arranged. The inflorescence is a spike or a rounded head occurring in the leaf axils or the ends of branches. The flowers have 5 tepals. There are 3 to 5 stamens which are fused into a rim at the bases, and 5 pseudostaminodes, appendages between the stamens that are not true staminodes. The fruit is a utricle containing one seed. The genus Alternanthera contains both terrestrial and aquatic species. The photosynthetic pathway varies in this genus: Some species undergo C3 carbon fixation, one clade of 17 species has acquired the C4 pathway, and yet other species have an intermediate C3-C4 pathway. Many species have been reported as noxious weeds, including A. angustifolia, A. caracasana, A. denticulata, A. nana, A. nodiflora, A. paronychioides, A. philoxeroides, A. sessilis, A. tenella, and A. triandra. The most important species is alligator weed (A. philoxeroides), a South American aquatic plant that has spread to other continents. It is a weed of many kinds of agricultural crops, it is an invasive species that degrades native habitat, and its dense mats of vegetation clog waterways, slowing shipping and increasing flooding. Alternanthera plants are known to produce allelopathic compounds that injure other plants, including crops. Biological pest control agents now in use to reduce alligator weed infestations include the alligator weed flea beetle (Agasicles hygrophila), the alligator weed thrips (Amynothrips andersoni), and the alligator weed stem borer (Arcola malloi). A. philoxeroides and A. sessilis are eaten as vegetables in parts of Asia. 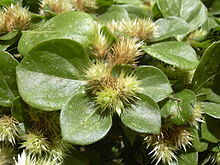 Some Alternanthera are used as ornamental plants. It is not yet clear how many species belong in the genus. Estimates range between 80 and 200. Wikimedia Commons has media related to Alternanthera. ^ a b c Sánchez-Del Pino, I., et al. (2012). Molecular phylogenetics of Alternanthera (Gomphrenoideae, Amaranthaceae): resolving a complex taxonomic history caused by different interpretations of morphological characters in a lineage with C4 and C3–C4 intermediate species. Botanical Journal of the Linnean Society 169(3), 493-517. ^ a b c d Alternanthera. Flora of North America. ^ a b Alternanthera. Integrated Taxonomic Information System (ITIS). ^ a b c d e f g h i j Tanveer, A., et al. (2013). A review on genus Alternanthera weeds implications. Pak. J. Weed Sci. Res 19(1), 53-58. ^ Sage, R.F. ; Sage, T.L. ; Pearcy, R.W. ; Borsch, T. (2007). "The taxonomic distribution of C4 photosynthesis in Amaranthaceae sensu stricto". American Journal of Botany. 94 (12): 1992–2003. doi:10.3732/ajb.94.12.1992. ISSN 0002-9122. PMID 21636394. ^ Chinthapalli, B., et al. (2001). Phosphoenolpyruvate carboxylase purified from leaves of C3, C4, and C3-C4 intermediate species of Alternanthera: Properties at limiting and saturating bicarbonate. Photosynthetica 38(3), 415-19. ^ a b Alternanthera. The Plant List. ^ GRIN Species Records of Alternanthera. Germplasm Resources Information Network (GRIN).